Your audiologist will be able to recommend the right hearing aid for you. If you are getting to a time in life that you think you should invest in a hearing aid, then you are about to make a great choice for your hearing health. 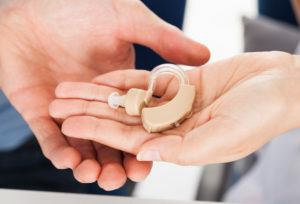 However, there are several things to consider to make sure that you get the best possible hearing aid for your needs. You should always get a hearing evaluation if you are seriously considering a hearing aid. Your audiologist is the best person to bring all of your questions. Being an expert on hearing and how the ear works, your audiologist will be able to determine what is the cause and type of your hearing loss. Sometimes you may have other factors, like earwax buildup or infection, that may be the source of your problem. Also, your audiologist will be able to recommend the right hearing aid for you. Whenever you first get a pair of hearing aids, there will always be a period where your ears will adjust. It may feel like your hearing aid isn’t working right for a few days or weeks even. Talk to your audiologist about how long the trial period is for your hearing aid, so that if it turns out that the hearing aid isn’t working you can still return or exchange it. When you ask about the trial period for your hearing aid, you will also want to consider what type of warranty comes with it. There are some warranties that will include labor in addition to coverage for the hearing aid itself. This means that you could have a warranty that takes care of office visits if you need an adjustment. You can always come into the office, or contact us in advance to set up an appointment. We also provide updates on our social media websites. You can check out our Facebook, Twitter, LinkedIn, and Pinterest to keep up with Bay Area Audiology. This entry was posted on Monday, April 8th, 2019 at 11:10 am. Both comments and pings are currently closed.